It took a while, but I have finished Mari Wyn. It was some way above my comfortable reading level, but I understood the outline though I lost some of the detail. There were times when I was not sure what was real and what was a dream or vision. Mari is a brave girl, and she will need all her courage for the future. Thank you, @Y_Ddraig_Las, for recommending the book. If you like post nuclear apocalypse “teen fiction” there is another one. Yma: Yr Ynys by Lleucu Roberts. This time a community of Welsh and Norwegian speakers survive by living in a cave on a Norwegian Island. Hundreds of years later, a group set out to return to Wales. I didn’t really get into it, maybe because I’d recently read Mari Wyn, the characters seemed less well developed and there was a lot of vocabularly I didn’t understand. I’m reading a grown ups book at the moment. Really it’s not that much of a step up from Mari Wyn, it’s just a lot longer. I’ll review when I finish it. This is the thing, to not worry about not understandng everything, to not look up words you don’t know and just enjoy the experience and next time you’ll know more words. I shall put it on my list of potential future reading. 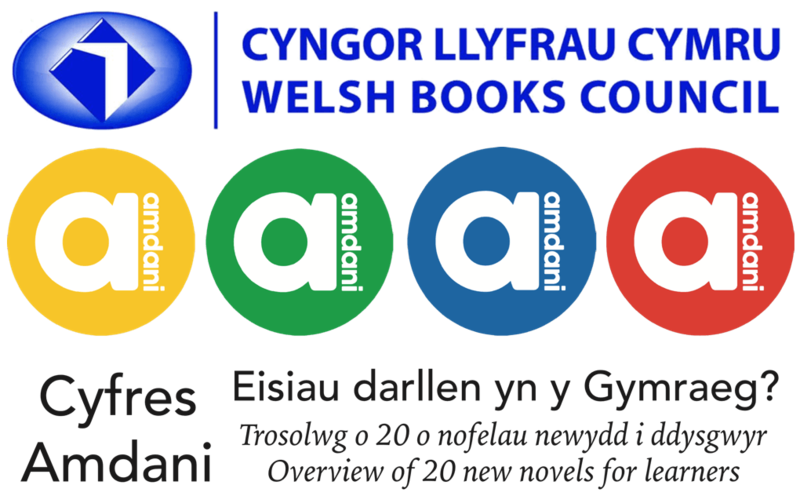 What sort of level Cyfres Amdani books should you try first if you’re on level 3 off the SSIW course? I suggest that Mynediad would be pretty easy, Sylfaen also good, Canolradd quite approachable and Uwch possible if you look some words up. It depends a lot on what else you have done and how much you have read before. I find that it depends very much on the subject matter of the book and whether I find it interesting. I don’t expect to understand every word. If I get the gist and guess words from the context then that’s OK for me. This is the first book in a series of detective novels set in a fictitious area in North Wales, and as of now the series consists of seven books. The book was out-of-print for a while, but luckily it has been reprinted earlier this year. The story takes some time to build up, with lots of characters being introduced, and the general theme is crime in the corporate/political world, so it’s not an easy topic. The language of the book is obviously not aimed at learners, with ample use of short forms and literary Welsh constructions in descriptive parts on one hand, and colloquialisms in direct speech on the other hand, which for me turned out to be a fascinating mix between challenging and satisfying. Once the story developed and built some momentum I found it impossible to put it down, and it’s an exciting page turner right until the end. So if you like detective novels and don’t feel daunted by the language level, have at it, you won’t regret it! Diolch for this @Hendrik, sounds like a challenging (for me), but interesting read. Ps, don’t forget, I’m expecting to sing a duet of anfonaf angel with you, yn yr parti benblwydd!!! I nipped in to a lovely little 2nd hand shop in Wrecsam today to see if there were any Welsh language CDs and ended up coming out with this lot including 2 books in the series mentioned by @Hendrik 2 posts previously. I now have more books in the “to read” pile than on the “finished reading” shelf. I have just finished reading Llyfr Glas Nebo and was wondering what to read next and I thought I’d take a quick look in the forum having a vague recollection of some book reviews…and Bingo! - once again the forum comes up trumps. Thanks very much for the reviews - they are excellent - a great idea and resource - and there is enough there to keep me going for a couple of years! I have taken the plunge with Blasu having seen your recommendation and enjoyed LGN very much - it seemed like destiny. In fact it has just arrived and having worked my way up the ladder - starting with books with large font - I have to say it looks like a ‘grown up’ book - in all respects. I have to say it looks like a ‘grown up’ book - in all respects. It is and it will but it’s really worth the effort. I don’t know where your reading ability is at the moment but if you can get through it without frustration and come out the other side having enjoyed it your ability will definitely have moved up a level. Did you enjoy Llyfr Glas Nebo? Obviously it is a dark tale but it is very well told. That degree of uncertainty / discomfort about a situation and what might happen next reminded me of watching Dr Who from behind the sofa when I was a kid! I think that’s an impressive thing to achieve from the authors point of view. If the idea of a page turner wasn’t quite so ludicrous at the speed I read Welsh, that is what I’d call it! I think I read it over 10 days or so, on a time-permitting basis. I found it a little bit of a step up at the beginning - previously I had read a couple of Pat Clayton books(quite good - anyone read any?) - which in turn were a step up (good stepping stone) from Louise Arnold - Sgwrs, Effrindiau etc. It takes your brain a chapter or two to make the adjustment doesn’t it. I think I know what to expect with this one! 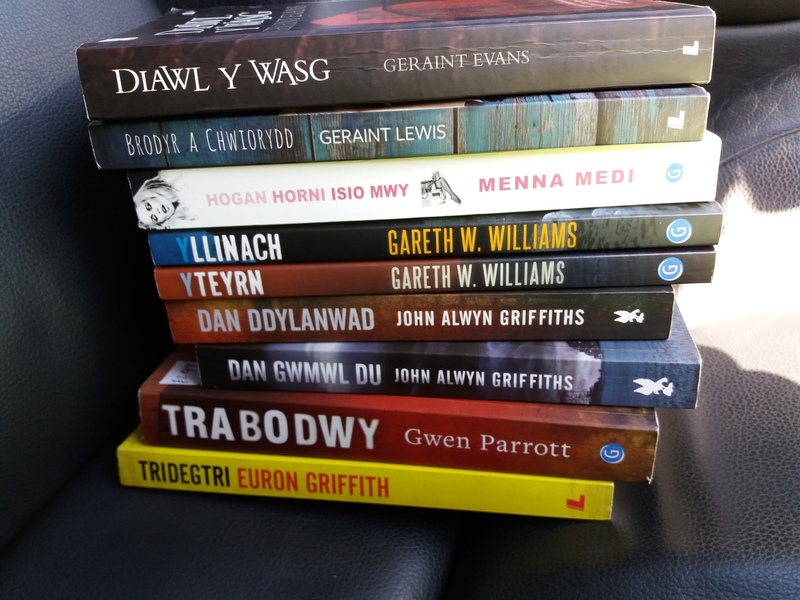 Hey, this is a cool thread, and I’m going to be buying some of these books very soon to help me improve my Welsh reading. I was wondering if there are any more stories (short stories might be best for now) specifically designed for learners and graded by level, i.e. beginner, intermediate, advanced, etc. Also, I’ve found that teen fiction is great for intermediate level in languages, as it’s not too simple but not too advanced. So more recommendations of any good Welsh teen fiction would be good too. 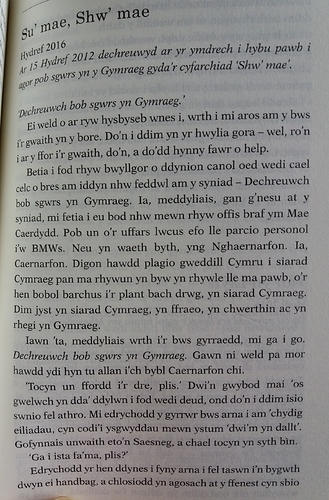 I was also wondering which form of Welsh, northern or southern, tends to be used in Welsh novels, or would it just be more of the formal/standard Welsh language, or a mix? I guess it depends on the author and/or where the story is set. I’m doing the SSIW southern courses - would it make much difference which books I can understand? Finally, are most Welsh stories written by authors in Welsh, or is there any danger that they might just be badly translated from English? How can we tell which ones are written in good Welsh vs the ones to avoid? “Ffenestri” by Lois Arnold is the obvious choice for graded short stories, though that has been mentioned several times above. I have tried a bit of teen fiction, but find it more difficult than material written for learners. Currently I am reading “Marc Daniel” by Dafydd Parri. Our hero is a famous private detective who thinks nothing of going out at night to meet shady characters in remote locations. I have reached the bit where he climbs up the chimney and over the roof to escape from the room that is filling with gas. Lots of action! As for north/south and formal/informal, yes it varies a lot. I don’t find north/south a problem because I think that you can pick up the different words quite quickly. I think that a little bit of formality is OK. I have never read anything in really formal, literary Welsh. I find that really informal language with lots of contractions is difficult. 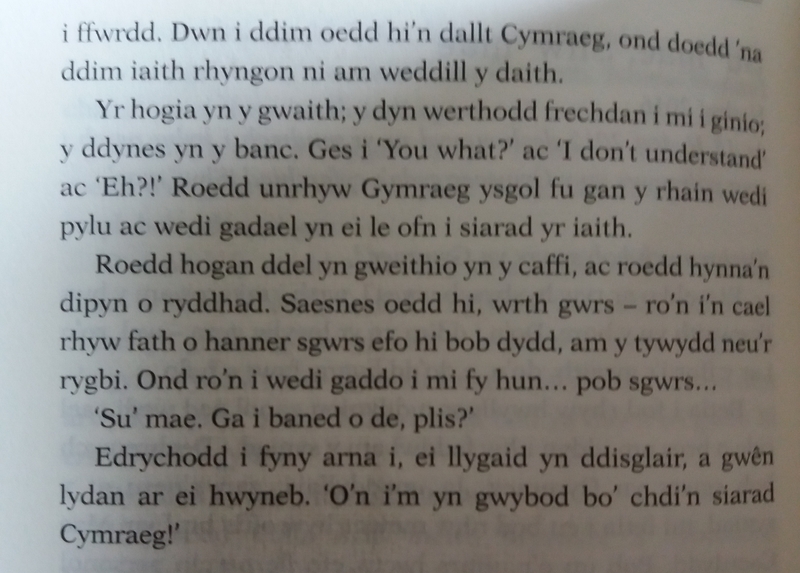 I have not come across books badly translated into Welsh, though I suppose that they exist. Some of the Cyfres Amdani series were originally in English, but they have been very well adapted, not just translated, by good authors. There’s a whole series of graded book for learners that came out last year I think. They’re all labelled with the level and colour coded. Unfortunately I can’t remember the name right now. Mist books seem to be North Walian to me but it’s not a big deal. Also sometimes it’s better to get a normal length book as it usually takes a while to get settled in and comfortable with an author’s language and the glossary of the story so to speak. 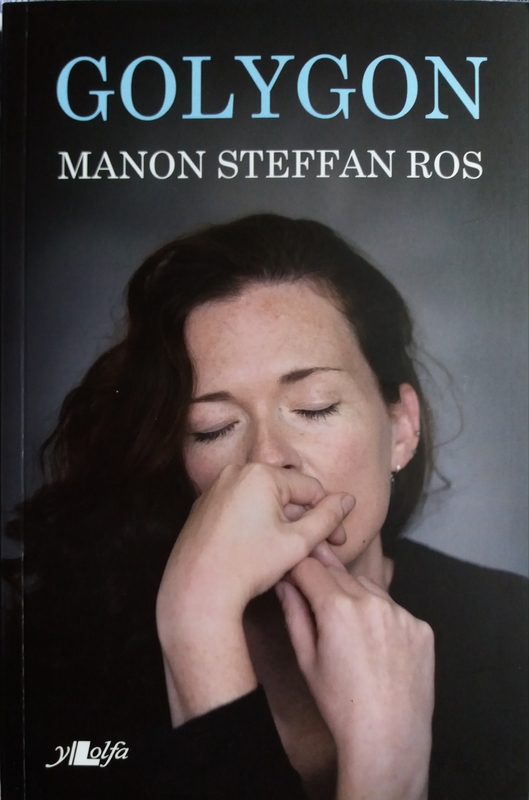 Manon has been writing a small piece of fiction every week for the magazine Golwg since January 2014, that’s a lot of short stories. This book is collection of those pieces in one place. Every week she has taken an event, a person, a place, a piece of news, etc. and created a way of seeing these through a different perspective. I’ve enjoyed every one of them without exception and thoroughly recommend this book to all. The level of reading required is more toward the high end but not difficult with a dictionary at hand to anyone other than complete beginner imo. The fact that these are very short pieces means that it is easy to dip in and out of if it gets too much.